About four years ago, I developed a reaction to a long list of fruit. Apples, peaches, pears, plums; any fruit that had edible skin made my throat itch, my hands break out with hives, and minutes later I was stuffing my face in the toilet, throwing everything up. During the summer when something exciting like a pluot is in season, knowing I’d have the reaction, I’d still take a bite, let it settle in my stomach a bit, get the same results and continue to finish it; the initial taste was worth the aftermath. At some point I guessed it was the pesticides causing this reaction and avoided any fruit that had skin — even peeling the skin led to the same reaction. Avoiding fruit with edible skin for so long and initially thinking organic fruit was too expensive, I finally decided to look for alternatives. From the Clean 15 list, the EWG found that no single fruit sample tested positive for more than four types of pesticides and seven percent of samples had just one pesticide detected. Fewer than 11 percent of pineapple samples showed detectable pesticides. Likewise, 78 percent of mango, 75 percent of kiwi, and 61 percent of cantaloupe had no pesticide residues. Overall, detectable pesticide residues were found on 67 percent of food samples after they had been washed or peeled. This year’s list Clean 15 list doesn’t depart much from last year’s findings, so at least there is consistency from year to year. For more information about pesticides and food, the EPA has answers to some frequently asked questions. Avocados are consistently on the Clean 15 list; reason being, their thick skin blocks out pesticides. Out of 15 fruit and vegetables, avocado samples returned with only one pesticide and the lowest percentage of occurrence — one percent of imiprothrin. From guacamole, to a spread on a morning toast, to a boost in a midday smoothie, avocados have become widely loved for their taste, versatility, and rich and healthy fat content. They are rich in folic acid, potassium, fiber, and offer numerous health benefits. Studies suggest avocado can protect from liver damage, decrease cholesterol, and due to it’s rich fat content, allows the body to absorb carotenoid antioxidant molecules to protect the body from free radical damage and inhibit oral cancer cell growth. Although avocados rank high on the list, there availability is becoming more difficult as Mexico’s government and rival Cartels continue to war over green gold. We rarely think to enjoy corn, yet it is in everything we eat in some capacity. Sticking to traditional corn on the cob provides the body with numerous health benefits. Although our body lacks the necessary bacteria to digest the outer shell of corn, it provides substantial digestive benefits due to a high fiber content. Whether on the cob or popped (use a pot versus the microwave), corn helps with healthy bacteria growth and inhibit the risk of colon cancer. Corn also has antioxidant properties, regulates blood sugar levels, and increase absorption of trace minerals. Pineapples are another thick skinned fruit that block out most pesticides, resulting in six pesticides being present, all occurring less than five percent of the time. For centuries pineapples have been used to treat inflammation — the leading cause of many diseases — and settle digestive issues, due to the protein digesting enzyme bromelain. As a rich source of vitamin C, pineapples can destroy free radicals which commonly lead to cancer, improve fertility, and regulate blood glucose levels in diabetes patients due to a high fiber content. Although cabbage has no hard exterior, it ranks high because minimal pesticides are required to grow it. Cabbage is another vitamin C rich fruit. Chelsey Wisotsky of Savor Health adds, “Cabbage and cauliflower are part of the cruciferous vegetable family which contain many cancer-fighting nutrients like glucosinolates, folate, vitamin C, and fiber.” Additionally, cabbage has anti-inflammation properties, red cabbage supports healthy cholesterol levels, and fiber’s 1 g of fiber for every calorie makes it a fiber dense food for improved digestion. Frozen sweet pea results showed 12 pesticide residues present when tested; although most were present less than four percent of the time. Peas are best sold frozen because they immediately become stale and old once picked. At 8g protein her cup, peas are a healthier alternative than the antibiotic plagued meats we regularly consume. Wisotsky adds, “Peas provide healthy plant protein to your diet and may help you cut down on eating animal protein.” Also high in fiber, peas can prevent constipation, improving bowel health and also regulate blood sugar levels. Rich in flavanoids, carotenoid, phenolic acids, and polyphenols, regularly eating sweet peas can provide anti-aging, immune boosting, and enhanced energy properties. Folate and B vitamins reduce heart disease risks and prevent osteoporosis. Onions have multiple protective layers: first the paper thin skin and an epidermal layer that protects each flesh leaf. This helps minimize the pesticides absorbed. Onions are a sulfur-rich vegetable, full of various sulfides and polyphenols. Sulfur has shown promise in preventing blood clotting, promote healthy cardiovascular health and limiting inflammation. Women in menopause who are losing bone density can use onions to lower their risk of hip fractures. The protective skin of onions has been gaining more attention as research suggests it offer additional health benefits. Quercetin, a bioflavanoid, resides in the skin and provides antioxidant and anti-inflammation properties, inhibits cancer cell growth, and can regulate gastrointestinal issues. In 2004 the Department of Agriculture released a study showing asparagus’ ability to degrade a commonly used pesticide called malathion. Although malathion residue did not show up on any results, the same enzymes that caused it to degrade, may help asparagus remove other pesticides. One of the key benefits of asparagus is its anti-inflammatory properties. A key nutrient — sarsasapogenin has shown promise in treating amyotrophic lateral sclerosis (ALS/Lou Gehrig’s Disease), which may worsen due to inflammation causing the death of nerve cells. Asparagus is also a diuretic, supporting a healthy bladder and resulting in a unique odor when you pee. Mangoes are well protected from pesticide due to their thick skin. Of the 11 pesticides present, thiabendazole is most commonly found at 15.9 percent. Mangoes are rich in fiber, decreasing risk of heart disease and Type 2 diabetes. The vitamin A in mangoes helps with vision and bone growth, while folic acid can prevent birth defects and anemia. Some people are known to eat mango skin for its rich antioxidants, fat cell growth inhibition, ability to kill cancer cells and help with morning sickness. If you’re planning to eat the peel, opt for an organic mango. Papayas are another thick skinned fruit that prevents pesticides from reaching the edible flesh. Most reports show eight pesticides commonly present. Editor’s Note: It’s crazy that we even have to eat any produce with poisons. Rich in carotenes, vitamin C, and flavonoids papayas support a healthy cardiovascular system, protect against colon cancer, decrease the risk of risk of age-related macular degeneration (vision loss with age), reduce the risk of rheumatoid arthritis, and when paired with green tea prevents prostate cancer. Learn about the most talked about antioxidant supplement in the world. Although kiwis, have thin skin, they are rarely sprayed with pesticides. Kiwi is an all-natural alternative to aspirin, since it helps thin blood but does not cause inflammation or internal bleeding. Being rich with vitamin C has shown kiwi to be effective in suppressing respiratory issues related to asthma. Its rich fiber content promotes a healthy colon, removing toxins and reducing colon cancer risk. Eggplants are part of the nightshade family, a group of plants, weeds, and crops that are found globally and used for various reasons. Many nightshades contain glycoalkaloid, a chemical compound that acts as a natural pesticide; with higher concentrations in unripe vegetables. Glycoalkaloid works by binding to the cholesterol in the cell membrane of pests, causing them to burst, in addition to working as a neurotoxin to overstimulate cells by blocking acetlycholine, resulting in paralysis and death. This allows eggplant to require minimal pesticides while being grown. Glycoalkaloid works to inhibit cancer cell growth. The skin of eggplant contains nasunin, a potent antioxidant that protects the brain from free radicals and inhibits excess iron absorption to promote healthy cholesterol levels and limit free radical damage in joints, which can result in arthritis. Honeydew’s thick skin keeps it protected from many pesticides. Low in calories and rich in natural sugar, honeydew is amazing alternative to keep the unnatural sugar addiction at bay. Honeydew is rich in potassium, a blood pressure regulator; vitamin C, an immune system booster and neuroprotector; and copper, a trace mineral that promotes cell regeneration. Grapefruits are part of the citrus family and are a rich source of vitamin C. Eleven known pesticides have been found in grapefruit, with thiabendazole being present 66 percent of the time. Lycopene, a cartenoid phytonutrient, gives grapefruit its pink color and provides anti prostate cancer properties due to its ability to destroy free radicals. Limonoids, another phytonutrient, promotes liver detoxification and fight various forms of cancer. The soluble fiber pectin aids in lowering cholesterol and the flavanoid naringenin helps repair damaged DNA. Cantaloupe flesh is also protected from thick skin. Of the 17 pesticides commonly found in cantaloupe, all are present less than 14 percent of the time. Rich in nutrients such as A, C, B, and K vitamins, potassium, flavanoids, and cartenoids, honeydew is a rarely recognized nutrient dense fruit. This diverse list of nutrients allows regular consumption of cantaloupe to provide anti-inflammation and antioxidant support, prevent cellular damage, reduce impact of sodium to regulate blood pressure, and promote bone, skin, and vision health. Fifteen pesticide are commonly found on cauliflower; the most present one being imidacloprid at 29 percent, which sub lethally kills bees. Cauliflower contains glucosinolates, a family of phytonutrients that offer numerous health benefits. Glucosinolates help regulate our cardiovascular, digestive, immune, inflammatory, and detoxification systems. Other phytonutrients such as beta-carotene and cinnamic acid provide antioxidant support. Purple cauliflower contains the flavanoid anthocyanin, a highly rich antioxidant compared to the ones in white cauliflower. As noted above, along with cabbage, cauliflower is also rich in anti-cancer nutrients. * A small amount of sweet corn, papaya, and summer squash sold in the United States is produced from GE seedstock. Buy organic varieties of these crops if you want to avoid GE produce. In addition to providing less pesticides, the Clean 15 offers an option for consumers who are looking for less expensive healthier options. 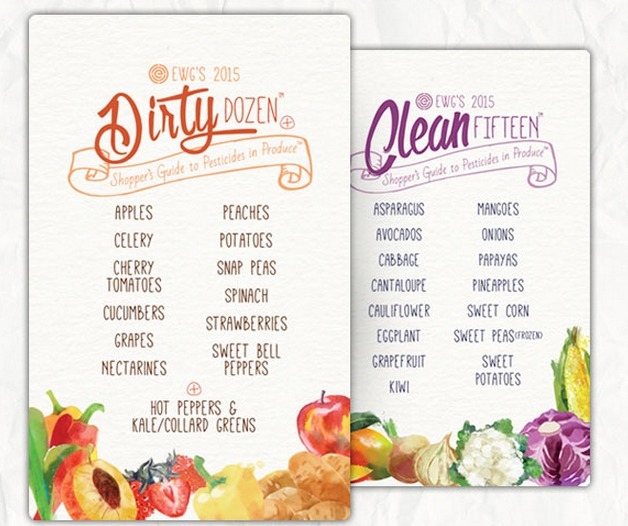 The list represents produce that can be purchased without being organic. However, produce listed on the Dirty Dozen, should be purchased organic to ensure the least amount of pesticides are present. I regularly purchase items off the Clean 15 and treat myself to a few organic fruit off the Dirty Dozen when I make my trip to the market — .86 cents for an organic apple adds up. For a complete list of pesticides present on fruit and vegetables, use What’s On My Food?